The stars turn out at NYC's Radio City Music Hall for Broadway's biggest night. Tony Awards host Sara Bareilles, composer of the Broadway hit "Waitress," arrives on the red carpet. 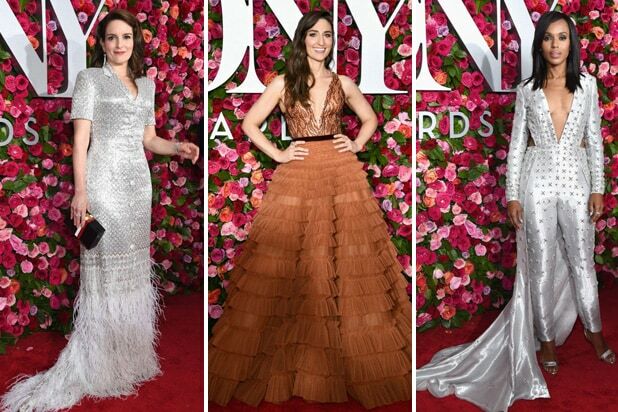 "Mean Girls" writer and Tony nominee Tina Fey arrives on the red carpet. Actress Schuyler Helford ("Anger Management") and Tony Awards co-host Josh Groban, a Tony nominee last year for "Natasha, Pierre & the Great Comet of 1812"
Former "Spider-Man" star Andrew Garfield, a Tony nominee this year for "Angels in America"
"Atlanta" star Brian Tyree Henry, a Tony nominee for "Lobby Hero," arrives at Radio City Music Hall. "Crazy Ex-Girlfriend" star Rachel Bloom sports a custom-made t-shirt honoring legendary Broadway composer Stephen Sondheim smoking a joint. "Superbad" star Michael Cera, a Tony nominee for "Lobby Hero"
Flaming Lips frontman Wayne Coyne, a Tony nominee for his songs for "SpongeBob SquarePants: The Musical," with singer Katy Weaver on the Tonys red carpet. "Roseanne" star and Tony winner Laurie Metcalf, a nominee again this year for "Edward Albee's Three Tall Women"
Director Michael Arden ("Once on This Island") and actor Andy Mientus arrive for the 2018 Tony Awards in New York City. Nikki M. James ("The Book of Mormon") arrives for the 2018 Tony Awards. Costume designer Clint Ramos, a Tony nominee for "Once on This Island"
Tony nominee Laura Osnes ("Cinderella") arrives on the red carpet. Tony winner David Zinn, a two-fold nominee for his costume and scenic design for "SpongeBob SquarePants: The Musical"
Tony winner Cynthia Erivo ("The Color Purple") arrives at the 2018 Tony Awards. Opera singer Renee Fleming, a Tony nominee this year for "Carousel"
Tony winner John Leguizamo arrives on the red carpet. Former "Smash" star Katherine McPhee, now starring in Broadway's "Waitress"